In my first article I wrote about Art Nouveau Architecture primarily as art applied as decoration. 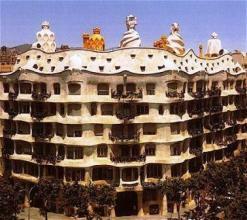 On the opposite side of Art Nouveau architecture you have Antoni Gaudi of Barcelona. 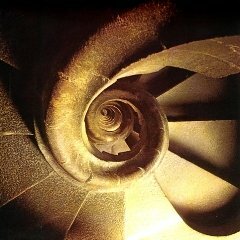 Gaudi was a one-man movement. He created a style distinct from all others. 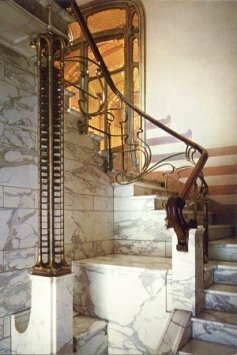 While Art Nouveau was not the only influence upon his genius, his creations more clearly and cleverly apply the sinuosity of Art Nouveau to the physical structures than anything coming out of Vienna or Belgium or any of the other hotbeds of Art Nouveau activity. 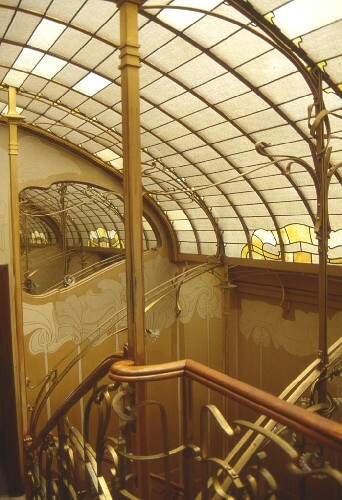 Not only did he apply the look of Art Nouveau to his buildings he applied its spirit to his investigations into they physics underlying structure. 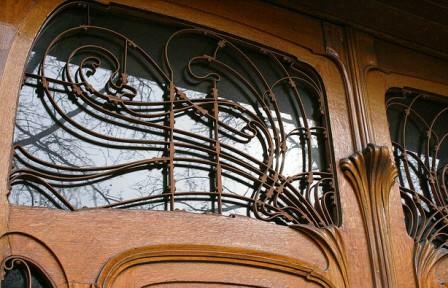 Art Nouveau looked to nature for inspiration. Gaudi looked to nature for innovation, and ended up with an Art Nouveau architecture that broke new ground in its basic engineering. His Casa Mila apartments eliminated the flat fronts with projecting balconies and replaced the façade with a curvilinear surface. 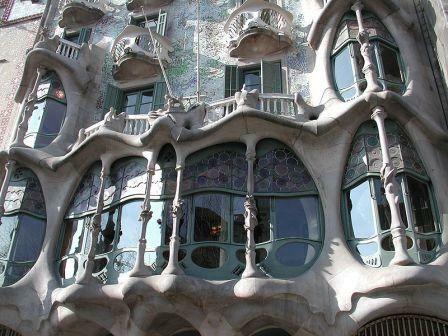 Casa Batllo has undulating picture windows behind columns that resemble bones. These houses aren’t necessarily beautiful, but they stand independent of historical architecture. 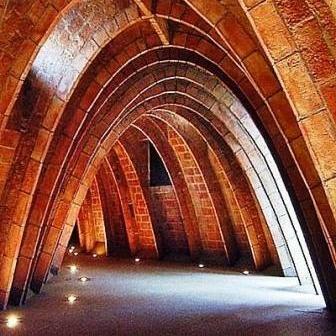 The bone-like columns in Casa Batllo is one example of Gaudi’s use of biomimicry, the copying of nature. At the base of Casa Mila we can see columns that resemble tree trunks. In his Sagrada Familia cathedral the arch columns never attain the vertical, but enter the ground at a slant. This is the form of a catenary arch, and it resolves the lateral forces pressing against the columns. The spiral staircases that ascend the towers of the cathedral follow the form of the helicoidal twisting pattern of a climbing vine. The stairs both provide access and provide strength to the tower. In Casa Batllo Gaudi tries a new take on columns. Whereas the Greeks imitated trees he imitates bones. Another genius at applying the style to the structures of his buildings was Victor Horta, a Belgian architect. He was working in the style before Mucha popularized it. He made extensive use of iron framing, but this wasn’t the latticed collection of I beams that would come to dominate the industry. His framing was artistically designed. The metal was formed into long, flowing natural shapes. Consider his own home, Maison Horta. The frame made it possible to open up the interior of the house, which he did, and then he added glass domes and skylights to flood the interior with light. This first picture shows the curved skylight, the supporting structure, and part of the stair railing. Here you can see how he integrates Art Nouveau into the framework of the house. The second picture shows the bottom of the stairs and his clever iron column supporting the staircase. My third picture is a detail from a door on the Hotel Solvay. Hotel in this case just means townhouse. The skylight, the staircase and the internal framing in Horta’s own home Maison Horta. Here is the bottom of those same stairs. The wild baluster design is clearly visible from this angle. I don’t mean to imply that only Horta and Gaudi applied Art Nouveau structurally. It is my contention that in most cases the Art Nouveau architecture was a surface affair. I merely use Horta and Gaudi as examples of what could be done, but generally wasn’t. This series of articles continues on when I discuss Art Nouveau Architecture in America.